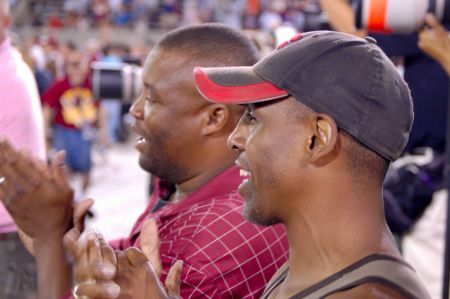 Gary Clark cheers on Art Monk at the 2008 Pro Football Hall of Fame induction ceremony as Ricky Sanders looks on. Photo by Mike Frandsen. Former Redskins guard Russ Grimm’s induction Saturday to the Pro Football Hall of Fame was long overdue. Grimm anchored one of the best offensive lines in history, the “Hogs,” who played in four Super Bowls, winning three. Grimm and the Hogs blocked superbly for the Redskins’ running game and passing game for a decade, ultimately helping running back John Riggins and wide receiver Art Monk become Hall of Famers. But Grimm was inducted into the Hall in his 14th year of eligibility. And it took Monk eight years, despite immaculate credentials. Why did it take so long? An anti-Redskins bias remains among Hall of Fame voters. The Redskins aren’t considered as glamorous as the Dallas Cowboys or the Pittsburgh Steelers, who each have 10 players in the Hall of Fame from their Super Bowl winning teams. Meanwhile, the Redskins only have four players in the Hall from teams that won the Super Bowl (Riggins, Monk, Grimm, and cornerback Darrell Green). This entry was posted on August 10, 2010 at 11:10 am and is filed under Uncategorized. You can follow any responses to this entry through the RSS 2.0 feed. Both comments and pings are currently closed.